← Should we resuscitate children? I have been trying to develop some sort of protocol for babies in our center, so I have been reading in some detail the studies about very preterm births and cord clamping that are in the literature. It seems from the PAS meeting that everyone is jumping on the bandwagon, hence my detailed inspection of the trials (and the Cochrane and other systematic reviews), because we are thinking of jumping on too, to make sure that we are going to do the right thing. As I was analyzing the studies, I found a number of disturbing issues, for example the study by Aladangady states that they did not report any clinical outcomes, the study by Baenziger also reported none, they both appear to have been part of a large multicenter trial of delayed clamping in the preterm, which has never been published. Which is outrageous. How can anyone morally perform a randomized intervention trial in a high risk population (or any population), and then not report ANY clinical outcomes, not even whether the “subjects” survived or not? Where are those data? These studies were from before registration of RCTs, so I haven’t been able to find out who has the data of these high-risk babies, who were randomized in an international RCT, and never published. Please, if anyone knows, the trial publication amnesty would make it easy to publish these extremely important data. There were 2 studies in the Cochrane review that I think we can disregard: the study by Strauss et al was a study for babies under 36 weeks, but those under 30 weeks were not randomized to DCC nor to cord milking; the intervention group <30 wk was an attempt to obtain placental blood by needle puncture of the placental vein, after immediate clamping and place in a transfusion bag for later infusion. They weren’t actually able to do this in any of the babies in that group except 1. So I think we can reasonably leave their data out of a very preterm baby review. Ultee et al only randomized late preterm babies 34 to 36 weeks, and the controls had a 30 s delay anyway, so it was really a comparison of DCC and very DCC. Heike Rabe’s study was also a comparison between 20 and 45 seconds of delayed clamping, although it included babies <33 weeks, with no stated lower limit, so it is a comparison of moderately DCC to DCC. We are therefore left with the other studies and can add two other, newer, RCTs not in the Cochrane review, Elimian and Gokmen, which add a total of 242 babies. In almost all the studies the average gestational age of the babies was between 29 and 32 weeks. So there are few very preterm babies in these trials. One of the studies included in the Cochrane review was not clearly randomized (Nelle et al is only reported as an abstract from the ESPR, and does not mention randomization). 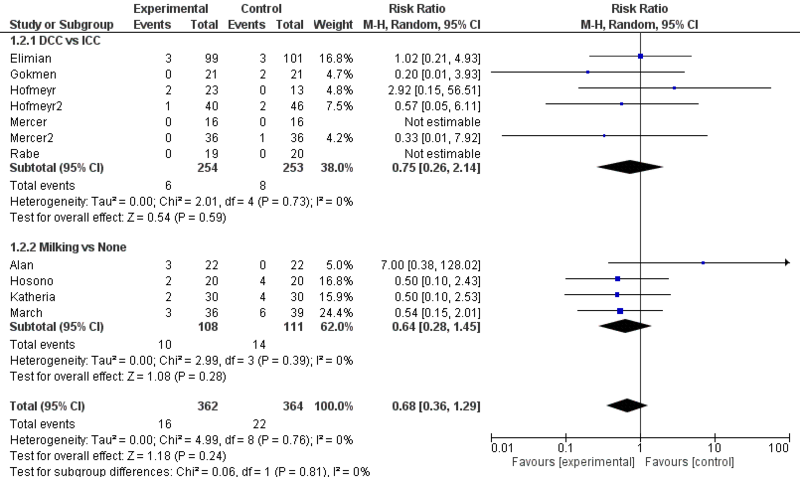 Others had outcomes which I think the Cochrane has tabulated incorrectly. For example the NEC outcomes reported from the Oh trial are for stage 2 or 3; but the numbers from the 2 Mercer trials and included in the Cochrane review, were actually the numbers for “suspected NEC” meaning, basically, any baby who had an abdominal x-ray. The numbers for actual NEC are in the publications, but harder to find, and not so clearly defined, also the numbers of NEC cases in the second Mercer trial are not consistent, the number in the DCC group is 1 in their Table 3, but 2 in Table 5. I have put the numbers for stage 2 NEC or worse, and used the figure of 2 cases from Mercer’s 2nd study. Also I am not clear of the numbers from the McDonnell trial, the paper states that 43 “cases” were randomized, which might have been mothers or babies (it is one of the few trials that includes twins, and there were 4 sets of twins, but data are very scanty in the publication). 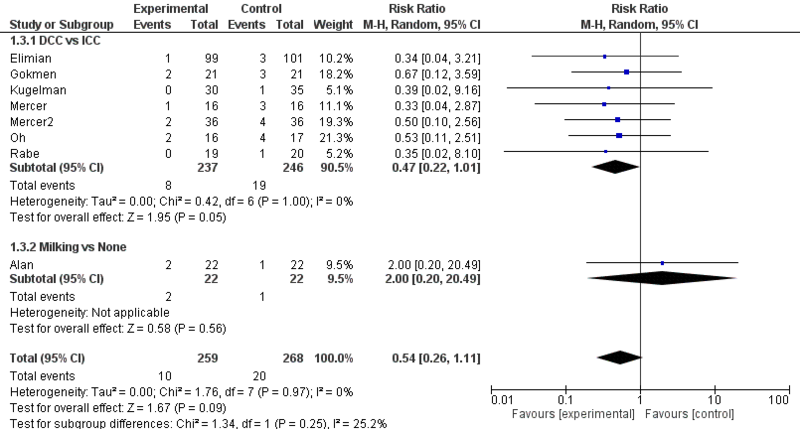 Other systematic reviews don’t come out of this scrutiny any better, The review by Backes includes data from the NICHD pilot trial twice, including the IVH rates from the abstract as well as from the final publication, they also use the same numbers from that abstract for total IVH and for severe IVH, and use an incorrect denominator for the late onset sepsis rates from that study. The meta-analysis by Ghavam et al, which is restricted to extremely low birth weight infants presents the “number of blood transfusion” (sic) which is reported as 79 vs 70 with a weighted mean difference of 2.22. What on earth does that mean? That review noted the paucity of data from the ELBW, and the consequent lack of power for any important outcome. They found extremely limited data regarding neurological/developmental outcomes, which showed no difference. One final problem with the data, the Hofmeyr study was published in the “online journal of Current Clinical Trials” which was one of the first on-line journals, set up by the American Association for the Advancement of Science. It lasted about 2 years, and then disappeared, in about 1995, with no arrangements being made to have an archive available. Which is also outrageous. Published data from RCTs which included sick patients are no longer available. Surely the AAAS could deposit them in Pubmed Central? Surely they have a moral responsibility to do so. As you can see, 2 of these studies were restricted to very preterm babies, with average gestational ages around 26 weeks, the others with average GA around 29-30. For each of these studies the cord milking required some delay in clamping also, as the cord was milked 2 to 3 times, often with a description in the papers of how fast to milk, meaning that cord clamping was delayed for probably around 10 to 20 seconds in many of these studies. There is therefore some overlap, especially with the study of Elimian, 30 seconds of delay with 3 to 4 “milking’s”. Finally to construct the figures that I am including here, I included the data from Ibrahim et al, that the Cochrane review excluded because the delay in clamping was only 20 seconds, and it therefore didn’t meet their criteria. The hematocrit and transfusion results do suggest that those babies got a significant transfusion, so I decided to put them in here. I couldn’t find any numbers for grade 2 NEC or severe IVH, only for mortality; it is also the only delayed clamping study restricted to very preterm babies, other than Oh et al, and their mean GA was 26.5 wks in the 2 groups. So 1000 babies randomized, all in very small studies, one which is slightly larger. The babies were largely at low risk of mortality, so the number of actual events, is tiny, and the difference between the groups could easily be due to chance, especially when you add the potential for an inflation of type 1 error with multiple small studies. The differences are in the direction of fewer hemorrhages with DCC, but a substantial chance that they are due to random effects. So again, tiny numbers of events, and differences which could be due to chance. insufficient evidence exists to support or to refute the benefits from delayed umbilical cord clamping for term infants that are born in settings with rich resources. Although a delay in umbilical cord clamping for up to 60 seconds may increase total body iron stores and blood volume, which may be particularly beneficial in populations in which iron deficiency is prevalent, these potential benefits must be weighed against the increased risk for neonatal phototherapy. But Iron Deficiency is prevalent everywhere, the exact incidence depends on your definition and the population. But, in the US it is between 7 and 21% in toddlers according to a recent review. With our current more restrictive phototherapy use, I can’t see any downside really for doing this as a routine in term infants. One of the best term studies, by Ola Andersson and colleagues was performed in Sweden in the recent era, and had about a 1% rate of phototherapy, not different between groups. He has also just published 4 year follow up of the infants in the study, showing some developmental advantages in the DCC group. In contrast, given the weakness of the evidence, their committee opinion for preterm babies is wrong in the other direction. However, evidence supports delayed umbilical cord clamping in preterm infants. As with term infants, delaying umbilical cord clamping to 30–60 seconds after birth with the infant at a level below the placenta is associated with neonatal benefits, including improved transitional circulation, better establishment of red blood cell volume, and decreased need for blood transfusion. The single most important clinical benefit for preterm infants is the possibility for a nearly 50% reduction in intraventricular hemorrhage. I think the evidence of benefits of cord clamping for any clinical outcomes is highly questionable in the very preterm, and given the fragility of these patients we really need good quality large studies, powered for clinical outcomes. Which are fortunately being performed, the APTS trial is planned to include 1600 babies under 30 weeks gestation. In the meantime, what to do while waiting for the results of adequately powered trials? The one benefit of delayed clamping or milking, which I think is clear, is that the babies have a greater red cell mass after either procedure. Which leads to fewer transfusions. 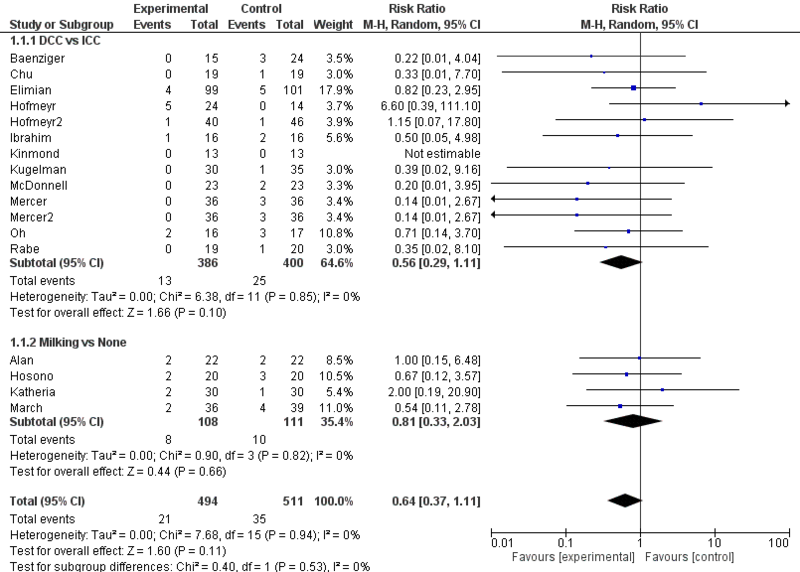 The transfusion outcome has not always been reported in the same way, so its not easy to do a meta-analysis, but I think it’s fairly consistent, almost all of the trials have shown a reduced need for transfusion, either the total volume required, or the proportion of babies transfused, and so on. That, in addition to the lack of harm shown in the studies, and the physiologic rationale suggests to me that it is reasonable to institute DCC (or milking) while waiting for the large RCT results. I think we need to continue surveillance of adverse outcomes after instituting DCC, including a watch on admission temperatures, especially for the most immature babies, but those have not been adversely affected to date. Figuring out how to resuscitate babies during DCC is an interesting idea, but given that the evidence of benefits of DCC could only be considered marginal as yet, I am not rushing to buy a special table. This entry was posted in Neonatal Research and tagged Randomized Controlled Trials, Resuscitation, Systematic Reviews, transfusion. Bookmark the permalink. I believe you had commented on a previous blog on Judith Mercer’s abstract at PAS this year. You may want to add it. It is one of the largest if not the largest. There was no reduction of IVH or death. Hi Keith. You comment on your Forest plots that the effects (eg halving of mortality, reduced IVH, halving of NEC) with delayed cord clamping “could easily be due to chance”. This is a really interesting question in statistics – how do we tell if a result (eg a clinically significant difference between control and intervention) is due to chance or not? Thanks for the comments, which I will probably mention in a new post, because I think they are related. I only put the published things in the Forest plots, but Mercer’s study, presented at PAS enrolled 208 babies under 32 weeks and basically showed no short term differences. I don’t have all the numbers to put in the plots, but if I did, then its likely that the differences would be even less marked than they are now. There were specifically no differences in IVH, or sepsis. The difference in mortality is actually between 6.8% in controls and 4.3% with DCC the p-value for the mortality difference is 0.11, which is far from being a 2.5% likelihood of being due to chance. Random selection of 2 groups of patients from the population of very preterm infants would show differences as great, or more extreme, 11 times out of 100. I don’t think that’s enough to be sure that this procedure is safe, let alone advantageous. The difference in NEC is 7.4% in the controls, and 3.8% with DCC, among the studies that reported the outcome, if we assume that those that didn’t report it had none, then the difference is between, 3.9% and 2.0%. The p value for the difference is 0.09, far from what we usually consider to be significant, and again not a 2.5% likelihood of being due to chance, but much more than that. If someone was to do a Jesper Brok style sequential analysis, I can bet you that it would be far, far away from a significant result. We’ve been here before, based on multiple small studies, IVIG seemed to reduce mortality in septic newborns. INIS showed absolutely zilch. I appreciate the comment about the importance of making sure parents are well informed of the current state of the literature when getting consent to enroll them, that is of course essential, and these things can be difficult to explain, but I would insist that it is by no means clear that the differences in mortality or NEC are really due to the DCC.